Jemma Radick is a Kansas City Chapter Co-Chair. Nathan Moody, Design Director at Stimulant in San Francisco has designed award-winning interfaces, interactions, illustrations, motion, and sound for two decades, in almost every digital delivery medium and communication channel, for some of the world’s best known companies. His broad range of experience informs his cross-pollinated, holistic approach to the design, art, and craft of experience design. For over 20 years, Darren David has traversed the blurry edges at the intersection of technology and design, exploring nearly every conceivable project role as both client and contributor. Darren's rich and storied career has wound from paper to pixels to people, across a myriad of companies and ventures that ultimately led to several “world’s firsts” and awards. At Stimulant, he provides business, vision and experience design leadership for an inspiring team of like-minded compatriots and pioneers, from whom he learns something new every day. SEGD is an amazing community of designers, fabricators and manufacturers who create experiences that connect people to place. One of the many membership benefits of SEGD is a library of talks from SEGD's 4-6 events a year. Starting from 2014, these videos are available for viewing for members for free. If you are a member please log in (hint: top right below search) to view this content. 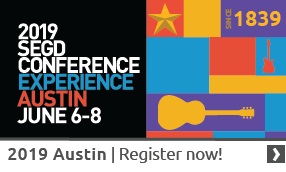 If not please join SEGD and experience its amazing resources. Alexandre Simionescu is co-founder of Float4, an experience design and creative technology firm with offices in Montreal, New York and Dubai. Alex graduated from École Polytechnique de Montréal 2006 with a degree in computer engineering which included a session in exchange at the École Polytechnique Fédérale de Lausanne (Switzerland). He was then employed by Ubisoft Montreal, where he worked as a programmer before co-founding Float4 in 2008 with his business partner Sevan Dalkian. Investigate the criteria that you need to consider when creating dynamic digital signage discussed from the perspective of the fabricator and the designer.